The foot of new snow in Monday�s forecast did not materialize. Nonetheless we were the first car in the parking lot Tuesday and found about 3-4 inches of new snow at Paradise from Monday night. What was falling Tuesday morning was a mix of rain, freezing rain and snow with light winds. We had already ruled out the southerly aspects based on the morning�s NWAC update, our active tests, plus it was just below freezing and the sky was trying to clear. I had heard from WSTC Nordic Patrollers that the trail from Narada Falls to Canyon Wye was thin ice, so we decided against the Tatoosh. 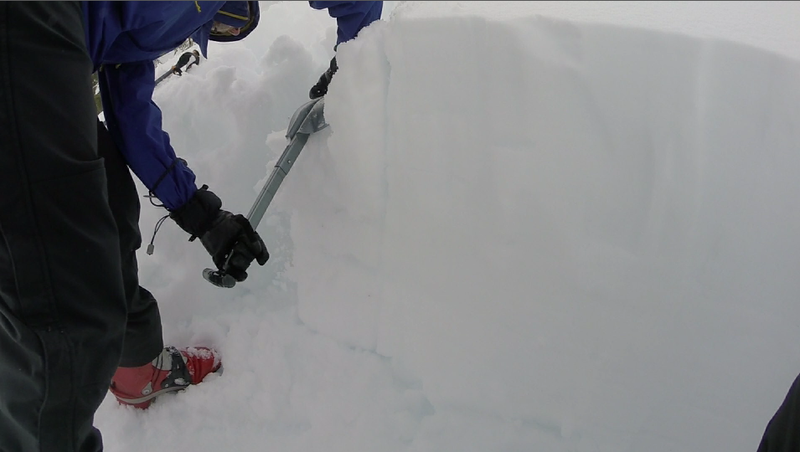 We picked another north aspect, threw a pit into the snow and found the layers to be stable. 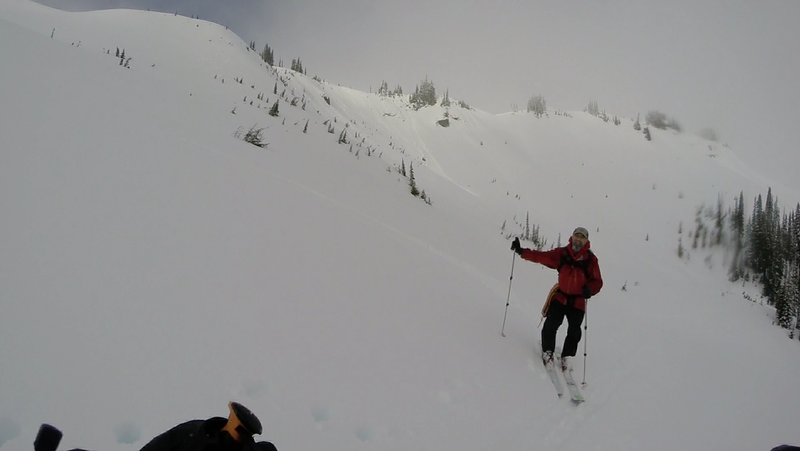 Since February 1 about 30 cm of snow has been added to the thin snowpack at Paradise. All of it is wet, heavy snow, but well bonded to the boilerplate January crust. The 30 cm interface will shovel-shear, as reported in Charlie Hagedorn�s TR from February 8, but it takes considerable effort. 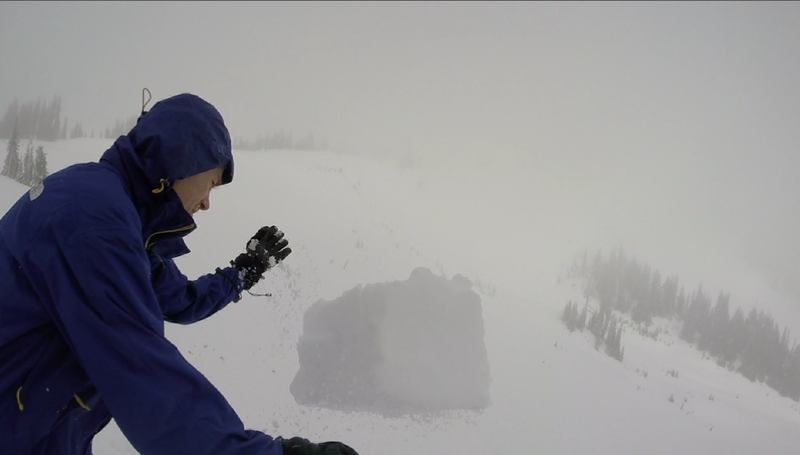 With much grunting we skied the N and NE aspects in disorienting flat light and poor visibility. As it warmed up at noon we saw a small R1 D1 natural point release on a steep south-facing slope. That confirmed our terrain selection and made us even more cautious. Icicles and snow started falling from trees. Snowballs appeared on south aspects. When the mountain came out at 3:00, it was time to go home. The Tatoosh Range was obscured in dark clouds all day. We got some good runs in, and the bonus views of Rainier. Thanks Mike and Peter for going for it! Edit: Here's a video with some test pit info. 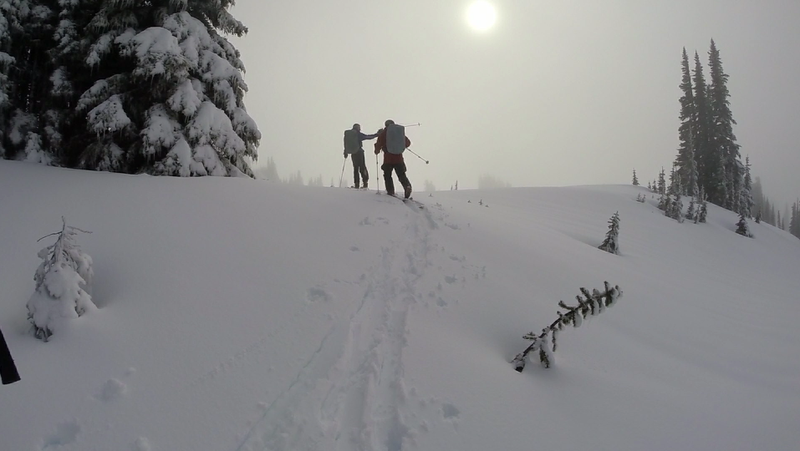 "With much grunting we skied the N and NE aspects in disorienting flat light and poor visibility. 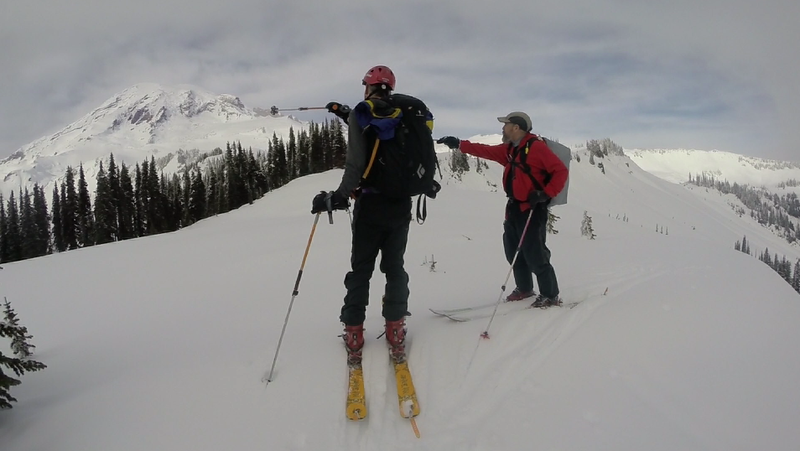 "� Yeah we saw your tracks today and wondered who in h*ll skis like that LOL Nice corn snow today (flat light and poor visibility as well). Right, Andrew, when the ski tracks look like 2 drunken snowboarders riding together, that's me skiing the fog, wide stance, trying to figure out which way's up! Notice I'm not featured in the video. Great report! 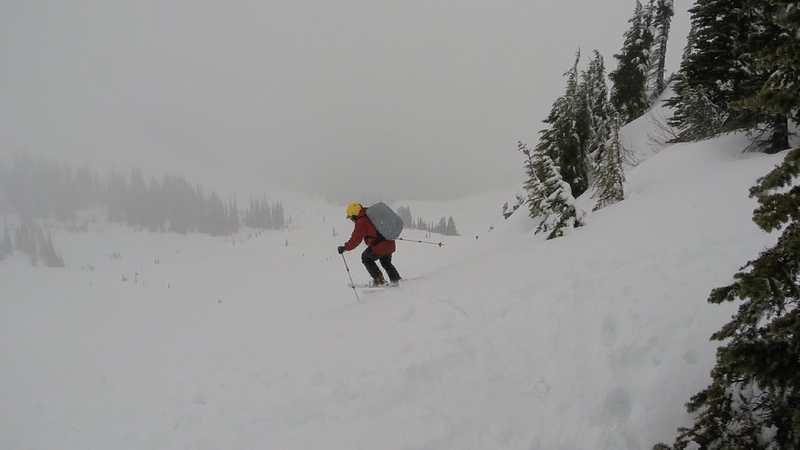 I completed an Avy I class this last weekend (shout out to the great folks at MW Mountain School in Leavenworth) and this stuff is making more sense. Reading your report reinforces what we learned. Glad to hear it Phil. I took Avy I this year for the 3rd time. It makes more sense each time. I took a class from Northwest Mountain School once, it was fun. 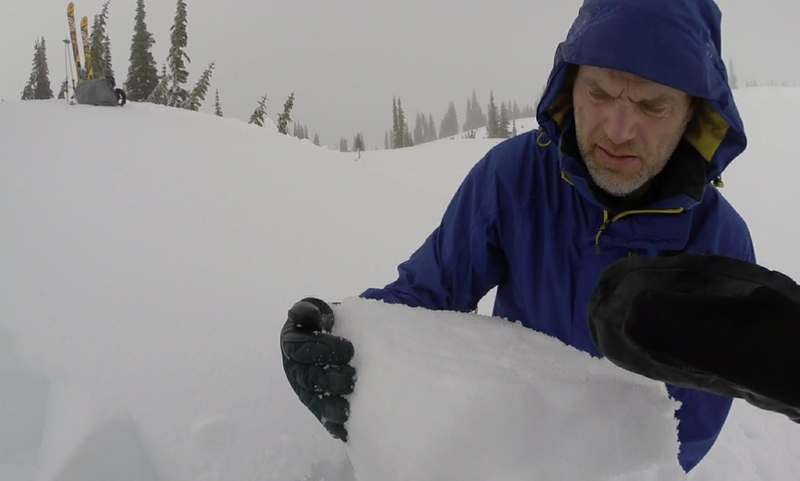 Check out the "Going Deep" series from NWAC for continued learning. I'm still an amateur. And I don't dig unless I feel it's really necessary. Nonetheless if you want the snowpack details from our pit that day, they're on NWAC here fwiw. (Sorry NWAC runs everything together into one big paragraph.) The video has the abbreviated version. Dennis, thanks for the tip on the "Going Deep" series, I'll check it out. At the Avy I class we were told that AIARE is reworking the Avy II class and plans to split it into 2 tracts - recreational and professional. I think this will be a good option for 'amateurs' like us. Phil, that's the direction Canada has gone with their training, as I understand it: divide recreational and career professional training. Speaking of Canada, Rusty, yes that is indeed Peter holding the column upside down in the photo & video.